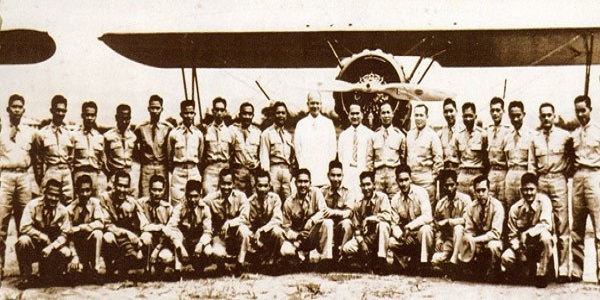 The Philippine Air Force (PAF) was established while the country was under US occupation. Aid and support from the US greatly influenced the PAF’s transformation through the years. The Philippine Militia Act of 1917 provided for an aviation section of the Philippine National Guard (PNG). Unfortunately, a limited supply of planes for training forced the section to disband a year later. Philippine military aviation resurfaced at the end of World War I, when the US found itself with a surplus of military aircraft. The Philippine Militia Commission, despite its lack of pilots and aircraft maintenance personnel, immediately bought these US planes. In 1920, the Commission hired the Curtiss School of Aviation in San Diego, California to train 33 students in military aviation at Camp Claudio in Parañaque. Among the 25 students who completed the course, six would compose the nucleus of the Philippine Air Service (PAS). Established in July 1920, the PAS was established to facilitate further training of pilots as well as provide transportation for mail and passengers to and from Manila, Cebu, Iloilo, and Zamboanga. However, lack of funds forced the PAS to disband a year later. The Philippines would have no aviation service for the next 14 years. Then came the Philippine Army Air Corps (PAAC), forerunner to today’s PAF. The PAAC was inaugurated with the passage of the National Defense Act of 1935, which was drafted by General Douglas MacArthur. The law provided for the formation of the Philippine Army. Unfortunately, the PAAC was still ill prepared for the onset of World War II. The PAAC aircraft were vastly outmoded compared to Japanese aircraft. Despite minor victories by the PAAC, Philippine air forces were eventually overwhelmed. The PAAC was ultimately ordered to retreat to Bataan and destroy all their remaining aircraft. The Filipinos would be unable to rebuild the PAAC until the Americans returned after the war. In March 1947, the Military Assistance Pact was signed. The US promised to provide the Philippines with arms, ammunition, equipment, and supplies. The pact also provided for the formation of the Joint US Military Advisory Group (JUSMAG), which would appropriate funds for defense projects as well as reorganize and train the Philippine military. This would equip the PAAC, so it could serve as a “self-respecting air power” for the Philippines. The Philippine military aviation would undergo its final transformation. The PAAC was officially designated as the PAF on July 3, 1947. The passing of Executive Order No. 94 on October 24 of that same year would establish the PAF as a separate command, of equal status with other major services in the Armed Forces of the Philippines. PAF. Flight to the Future: Perspectives on the First 50 Years of the Philippine Air Force. Pasay City: 1997. PAF Historical Group. Guardian of the Philippine Skies: 1917-1970. Pasay City: 1970.